Avcılar is a district of Istanbul, Turkey, out of town on the European side of the city, just to the west of the Küçükçekmece inlet of the Sea of Marmara. The Marmara coast road bridges the mouth of the inlet, always an important route in wartime. Therefore, when preparing the conquest of Istanbul the Ottoman forces were keen to populate the Küçükçekmece area with the Turks, the Turkish presence in the area dates from this period. The road from Istanbul to Europe has become increasingly important ever since and by the time of the population exchange with Greece at the founding of the Turkish Republic there were 50 Greek families in the village, the property they vacated was then used as a military depot. Little is left of this history; the church had long been converted to a mosque and was pulled down in 1977 for a new mosque to be built; fountains and ruins have disappeared. There is some remaining Ottoman architecture including a hunting lodge belonging to the sultans, (the name Avcılar means 'hunters' in Turkish), and some traditional farm houses. Until the second half of the 20th century, Avcılar remained as a small village on the coast with lots of open land. It has grown enormously since the 1980s. An incredible amount of housing has been built. There has also been a great deal of industrial development, around the port and also on the road out towards the village of Firuzköy, which overlooks the inlet. At one time the seashore at Avcılar was a retreat from the city, but now the port at Ambarlı is very busy. The road to Europe carries more traffic than ever, it is now a busy highway, littered with billboards and heaving with trucks. Travelling into the city from Avcılar requires winding up onto this highway from Avcılar's network of bridges and narrow underpasses. Apartments in the centre of Avcılar near the sea are expensive . The centre of Avcılar has places to sit outside, many restaurants, two cinemas, an active night-life and a busy shopping area with pedestrianised shopping streets with American-style fast-food joints, narrow side-streets of little shops and cafes. Young people wander among people selling goods on the sidewalk. After the 1999 İzmit earthquake, the demographics of Avcılar changed dramatically. Before the earthquake, majority of the population was Turkish immigrants from the Balkans, civil servants, university students and the sorts which constituted a relatively low crime rate. However, after the earthquake, most of these people left the district for most of the buildings were of low build quality and very vulnerable to earthquakes. The low estate prices attracted many people from mid and east Anatolia and this new demographic introduced a higher crime rate in Avcılar. One of Istanbul University's campuses is sited in Avcılar, housing the faculties of engineering, business management, sports and veterinary medicine. The campus is far away from the Anatolian Side of Istanbul and transportation was very complicated and difficult before the introduction of the Metrobus system. There is parkland in the campus and around Lake Küçükçekmece. This district was badly hit during the 1999 earthquake. A major fault-line follows the Marmara shore and Avcılar is built on low-lying sandy soil, some of it landfill, right on this shore. This and the fact that the buildings are tall and were very cheaply built make it a particularly vulnerable area. Buildings damaged in 1999 have been repaired but an earthquake centred nearer to Istanbul will damage this area severely. "Information on Avcılar district" (in Turkish). 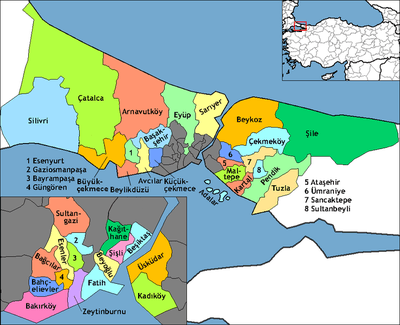 Governorship of Istanbul. 2009. Archived from the original on 2011-07-16. Retrieved 2009-08-16. Wikimedia Commons has media related to Avcılar.